This picture shows a nice Whitetail Deer Buck in his summer red coat and his antlers in the velvet. Studying deer in the whitetail family is definitely interesting and informative, and there are many whitetail deer facts to be learned about the buck, doe, and fawn and how they live and mature. While many people show interest in the doe and the cute fawns, it is the whitetail deer buck that piques the interest of so many people, with their majestic antlers and fighting personalities. 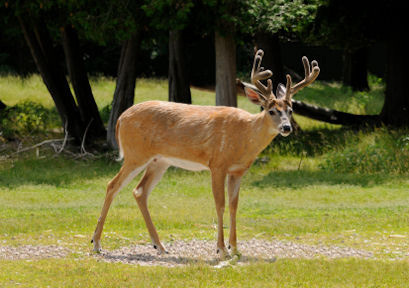 So, let's take a closer look at the whitetail buck and his life during the summer months. During the summer, the buck has a pretty lazy life, and spends most of the time looking for whitetail deer feed so that he can store up fat to last him through the long winter months that are sure to come. Because whitetail deer bucks have low testosterone levels during the summer, they are not very active during these months. Instead of engaging in a whole lot of activity, they spend much of their time learning things about other bucks within the heard that they run with, especially the younger ones. There are a variety of different foods that the buck has to enjoy during the spring and summer months. Many of the foods they are now able to eat are full of nutrients, which is a great change, compared to the sparse, nutrient depleted food that he was eating during the winter months. Another thing that occurs to the whitetail deer buck during the summer is that his antlers continue to show quite prominently. The size of a buck’s antlers depends on both age and nutritional intake. The growing bone is full of blood vessels and nerves and is covered with velvet (hairy skin). When the buck's antlers are covered in velvet, they are usually quite sensitive and you'll find that the buck is very protective of the antlers during this time. While their antlers are still covered in velvet, you will not find a buck fighting with his antlers. Instead of antler fights, at times you'll see fights where bucks use their forelegs to spar, since their antlers are not yet hardened. The velvet antlers are actually so sensitive, that if you watch a buck, he will walk very carefully through wooded areas, working to avoid brushing anything with his sensitive antlers. 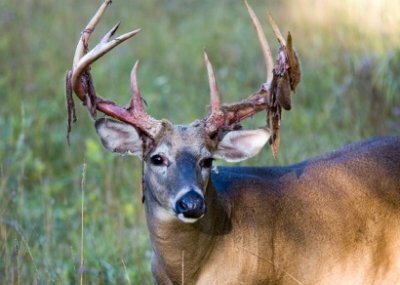 By late August or early September the bone hardens and the velvet dries up and sloughs off or the whitetail buck will start rubbing off the velvet, which usually takes a couple days or more. While they are rubbing off their velvet, they also have play fights with the trees and brush that they are rubbing their horns on for practice. Some bucks will get rid of their velvet first, and it is not uncommon for a buck with hard antlers to challenge a buck still in velvet to try and show his dominance when the other buck is still quite sensitive. While you will find that summer is a more lazy time for whitetail deer, there are some problems that can occur during this time as well. Whitetail deer feed can be affected by local droughts that make it harder to find food, which may mean that they have a hard time fattening up for the winter. The Whitetail Buck above is losing his velvet, or shedding his velvet if you like that term - notice the blood and the hanging velvet. Maybe the next time you see this guy he will have nice polished antlers and his neck will be thick from rubbing them on saplings and small trees. However, as a general rule, summer is a slow and easy time for the buck when he is able to eat, fatten up, and get ready for the rut season and the following winter as well. The summer is all preparation time for the harder months to come when it comes to the whitetail deer buck.